I love that you don't have to wear plain old black pantyhose anymore (unless you want to). 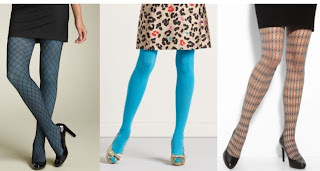 You can find almost any color and design of tights imaginable. Here are a a few of my favorite tights I found. What kind of tights do you wear? Oooo lots of fun options. I think I am going to try some lace ones this year! Love that red pair! SO fun! I'm wearing a lace pair this weekend to a wedding. Can't wait!